Report is updated when a change of status occurs. Ocean and bay waters are posted with warning signs when bacterial levels in ocean or bay waters exceed health standards. Click a posting when displayed to see the location. Newport Slough – Lancaster Street at 61st Street at the Newport Slough (posted 4/18/19). Dana Point – 500 feet upcoast and 500 feet downcoastof San Juan Creek at Doheny State Beach (posting expanded 4/19/2019). San Clemente – 500 feet upcoast and 600 feet downcoast of the San Clemente Pier (posting reduced 4/19/2019). Ocean or bay water advisories are issued to alert the public of real or possible elevated bacteria levels associated with urban and storm runoff at outlets, such as storm drains, creeks and rivers that can impact ocean and bay waters. Click an advisory when displayed to see the outlet location where ocean bacterial levels have exceeded health standards in the mixing zone between the runoff and the receiving ocean water. Laguna Beach – 75 feet upcoast and 75 feet downcoast of Broadway Creek at Laguna Main Beach (posted 4/16/19). Dana Point – 75 feet upcoast and 75 feet downcoast of Salt Creek Ocean interface at Monarch Beach (posted 3/29/2019). Poche County Beach – 75 feet upcoast and 75 feet downcoast of Poche Creek at Poche Beach (posted 4/10/2019). The Environmental Health staff advises swimmers that levels of bacteria can rise significantly in ocean and bay waters adjacent to storm drains, creeks and rivers. Swimmers should avoid coastal waters impacted by discharging storm drains creeks and rivers, and beach users should avoid contact with any runoff on the beach during dry or wet weather conditions. Long term warnings occur at locations where bacterial levels consistently exceed health standards, usually from the impact of urban runoff. Click on a posting to see the location. This report provides an updated analysis of bacteriological water quality data for Orange County’s recreational waters and includes data on sewage spills and related ocean, harbor and bay water closures. Whether you are viewing our website on your desktop, tablet or phone, our site responds to your screen size and adjusts the content and navigation for a better view. 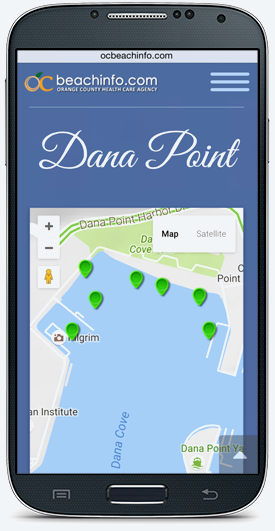 Maps, traffic reporting, photos, amenities, contact information, weather and water conditions. Almost everything you need to make your visit to our beaches a great experience. Don’t forget to bring your sunscreen!